Trim castle is enormous - the largest Anglo-norman castle in Ireland, and was built by Hugh de Lacy and his son in late 12th century. Construction began in 1176 and continued for thirty years. An earlier wooden castle stood here, replace by this enormous cross-shaped tower house. A ditch, curtain wall and moat around the tower. these are built on the remains of a huge ringfort. 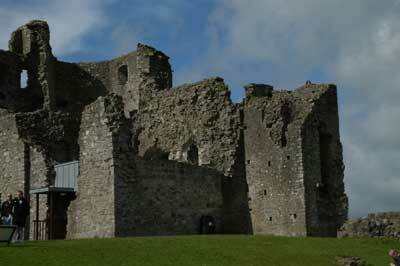 THe first stage of building included the main hall and north tower, in the second half of the 13th century. 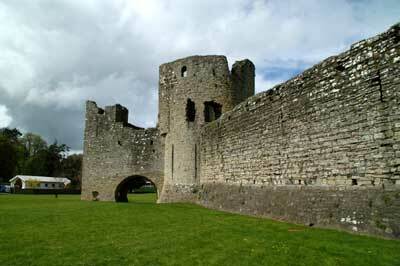 The castle went to the Mortimer family in the 14th century and they held the castle until 1425. There are three storeys in the main keep, and the odd cruciform shape has twenty different corners due to narrow stair towers tucked into the main tower.Two huge gates lead to the castle - one dating back to the 1170s. The walls have eight round towers along the length,. 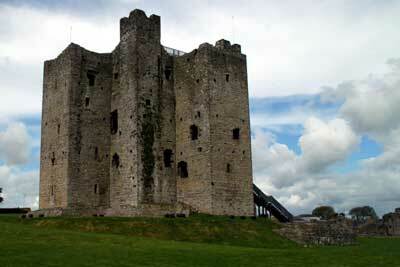 The River Boyne here made the castle accessible from the sea, and it became an important site. It was the Meath administrative center. It was abandoned in the 16th century and did not rise again until it was granted to the Wellington family in the 17th century after the Cromwellian wars. From there, it has been owned by he Leslies, the Plunketts, and finally to the state. It was used as a rubbish dump for awhile before excavations began in the 70s. The castle was a location for the film Braveheart. On the site are a number of other buildings, including the Yellow Steeple, Sheep's Gate, and a 17th century mansion house currently being used as a school.